I recently had an amazing opportunity to attend an all women’s night out for the Summer Solstice. For those of you who aren’t too familiar with the solstice, it happens each year around June 21st, (which is the beginning of summer) and has the longest period of daylight. While many worldwide interpretations are different, many recognize this event in festivals, rituals, reflection and it sometimes has a theme of religion or faith. A very well know women in my Lehigh Valley community, Jane Wells Schooley, invited me to attend her women’s night out with about 30-40 other women. I didn’t really know anyone else attending, nor did I know much about the Summer Solstice, but I knew I wanted to continue to get more involved locally, especially with someone as inspirational and influential as Jane is. I was honored to have been invited, so although I felt a little out of my comfort zone and unsure about what to expect, I decided to go anyway. This brought me to think about how many other opportunities we miss out on simply because we aren’t sure what to expect or what the outcome will be. Our comfort zone is the area we’re used to, stand by and most likely don’t even think about everyday. But, is staying there going to help us grow? It might seem like a small deal… “Come on Aurora, how hard is it to go out with a bunch of women for the evening?” I get, it does sound silly when you pose it like that, but think about it. The small voice in the back of my head telling me, “you don’t know anyone, you might feel uncomfortable,” could be enough to make any of us turn down an invite. Without going into tons of detail about the event, I can tell you that it was amazing, and I’m so glad I went. I’ve never been in a group of women like that before, where everyone was encouraging, supportive and getting to know one another openly. While I was nervous in the beginning and unsure of how I would feel, I took the opportunity to step out of my comfort zone and to meet new people. I’m beyond thankful for the invite and know it was a great decision to attend regardless of what my little voices told me. This is the reflective part… Think about one time you wished you had later done something that you chose not to, because of stepping out of your comfort zone. Did you miss out on something new, different or exciting? Are you afraid to say or do something you normally wouldn’t because it’s not normal to you? Try it out. Life is still going on when you’re not ready or sure of the path you want to travel down, so why not just go? 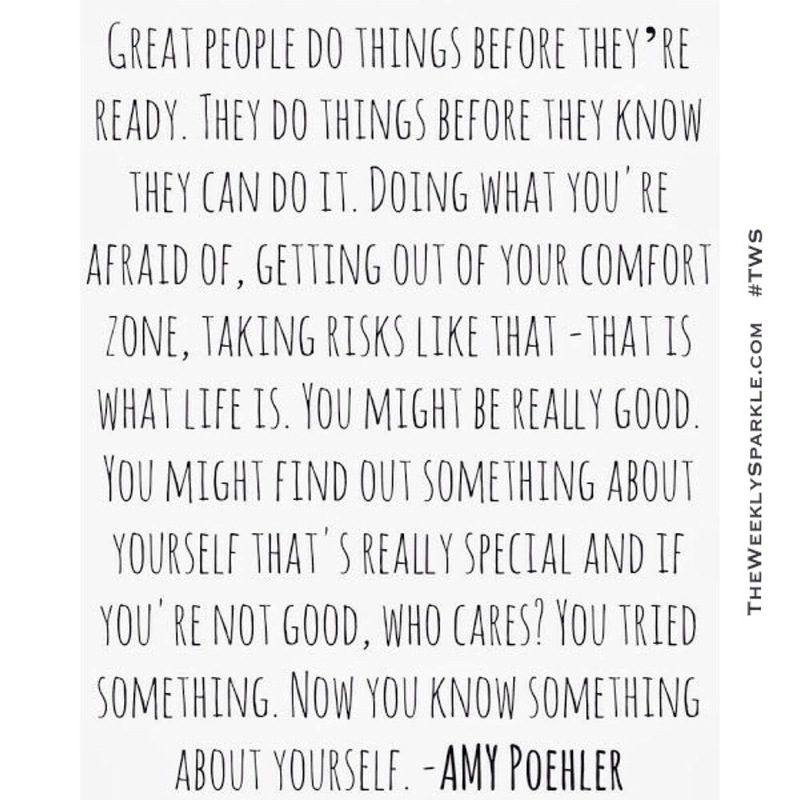 Be uncomfortable, take chances, be open to vulnerability and allow yourself to grow. It’s okay to be scared, nervous or unsure, but why limit yourself and stay there? They say life truly begins at the end of our comfort zone, and while I’m not 100% sure of that’s true or not, I’m gonna give it a shot.